Abstract : We examine the orbital dynamics of droplets self-propelling along the surface of a vibrating bath. Circular orbital motion may arise when the walking droplet is subjected to one of three external force fields, the Coriolis force, a simple harmonic force, and a Coulomb force. Particular attention is given to a theoretical characterization of the onset of chaos that accompanies the destabilization of such circular orbits. Tambasco, L., Harris, D., Oza, A., Rosales, R., & Bush, J. (2015, November). 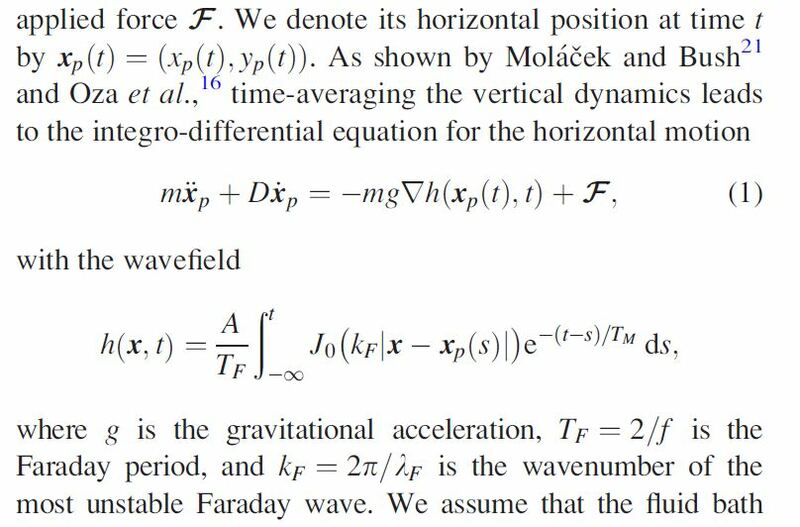 Onset of chaos in orbital pilot-wave dynamics. In APS Meeting Abstracts.